As you can tell by the title of this post, my little bloggie here is about to have it’s 1000’th Comment… I’ve been looking at this goal for a long time and just counting off the numbers ’till we arrived at the big 1000. I thought we could celebrate this occasion by a bit of a contest… The person who is the 1000th comment giver will get to choose one of any of the books I have in my destash sale as their prize! (except the 2 looming books, as those are not mine to give away willy-nilly, lol.) How does that sound?? What are you working on right now that’s fibery related? What project are you just dying for somebody to design on the looms? What book would you choose from the destash sale for your prize if you’re the 1000th commenter? Okay! That’s it…I’ll be posting the winner on Monday August 24th, so be sure to check back to see if you’re the lucky commenter…and feel free to have a little fun with this! ;D Also…don’t forget that there are still some wonderful crafty books for sale…check it out before they’re all gone! This entry was posted in Blogging, Books, Contests, Goals, Knitting, Loom Knitting. Bookmark the permalink. 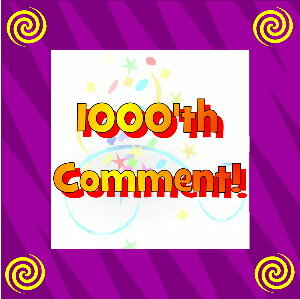 14 Responses to 1000’th Comment Contest! 1.What did you have for breakfast this morning? Eggs and beans with tostadas. Yeah, not to healthy. 2.What are you working on right now that’s fibery related? I am working on a pair of leggings. 3.What percentage of your holiday giving this year will be loomy related?…or have you even thought about it yet, lol? Hmm, probably 1 needle knit related item…so about 20% of my gift giving. 4. What project are you just dying for somebody to design on the looms? Ok…answer to question 5. I would choose weekend sweaters or the scrap afghans….. I just finished a bomber hat but starting another one. What project are you just dying for somebody to design on the looms? an easy tank top that would fit us larger women. ODDLES OF OUTERWEAR FOR CANINES!!!! 1.What did you have for breakfast this morning? 2.What are you working on right now that’s fibery related? Central Park Hoodie….you should go see the back on my blog, so pretty! 3.What percentage of your holiday giving this year will be loomy related?…or have you even thought about it yet, lol? You know the procrastinator in me! I haven’t thought about it, but I had a fleeting thought of making loomed slippers this year. 4.What project are you just dying for somebody to design on the looms? 2. What are you working on right now that’s fibery related? 5. What book would you choose from the destash sale for your prize if you’re the 1000th commenter? I can Quilt, I would give it to one of our new sewers in my group. 4.What project are you just dying for somebody to design on the looms? There are a billion cute things out there already!!! Maby a skirt!!! 5.What book would you choose from the destash sale for your prize if you’re the 1000th commenter? That is a toughie!! im not sure yet!!! about 80%, the rest being edible…and freshly baked! Not sure, maybe the scarves book, I seem to make a LOT of scarves each year! 1. like a tuna melt but with tomato and cheese, from the garden! 3. Xmas fibery gifts. Most will get something fibery but otherwise they get something homemade! Either baked, canned, food kit, sewn etc etc etc!! We do this each year, so i would say close to 90% that leaves the house is handmade by us. Nothing currently because my stash is still locked away in storage at my college! But I just got a spinning wheel and am super excited about that! I don’t think I’ll be making anything on my looms for Christmas…but I probably should try to put them to use! What a great way to celebrate your blog. I’m new, coming over here from someone who mentioned the contest, but I like the look of your blog. Clean and interesting. Right now I am working on knitting my 3rd sock ever. It’s slow going but I’m almost done. And then I have to start on the mate! 1. I had a bowl of Cheerio’s for breakfast. 2. I am working on a neck down shawl for charity. 3. I am a needle knitter but am thinking about buying a loom after seeing a couple of people knit on them. 4. Not sure what projects I would like to be designed for a loom. 5. Any of the afghan books for the destasth list.